On occasion of feast of the Presentation of the Lord, February 2, 2018 together with monks of Chevetogne Abbey the eighth session of the council of Paris Eparchy finished with a resulting conversation about unity, adopting a resolution and Liturgy in Latin rite. 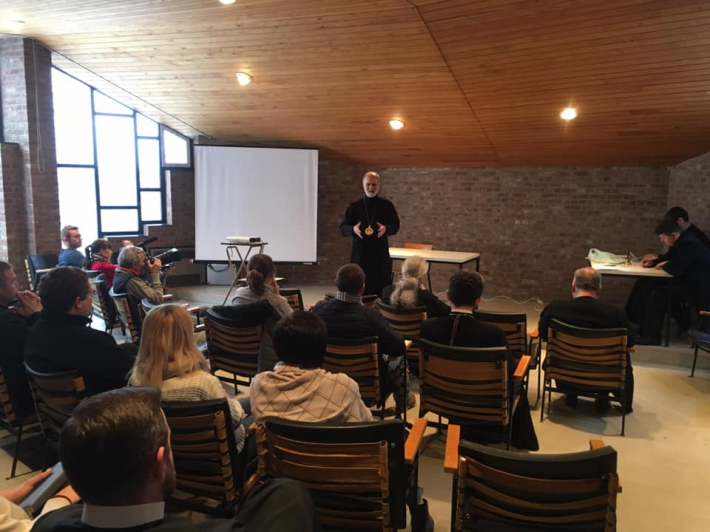 Bishop Borys Gudziak addressed the delegates from the five countries located within the eparchy with closing remarks summing up two days of work and encouraged priests and laity to seek after unity and truth in their service. During the council many delegates were discussing the difficulties of living a Christian life and preach in secular Western Europe, as well as challenging situations in and around premises and Church properties. “In God there is a unity, a perfect communication and love which is shown to a poor and wounded person. The sacrifice of Christ laid the foundation for renewal of this unity. God is love and we are called to love God and our neighbors. All the rest is just supportive or else unnecessary. “Thank God in our eparchy, despite our weaknesses, love is growing. We know that God has always been with us and many people have made tremendous sacrifices. But we also know what kind of difficulties existed as well as minor conflicts. We know how little "territorial wars" of small-minded men were destroying big things”. “The measure of authentic faith is mature relationships with those people whom God has entrusted to us. Another barometer which can help us to measure our spiritual growth are joy, peace, laughter. A smile which is ready to bring sacrifice, a smile that says: yes, you can rely on me”. “The opportunity for growth is present everywhere, but it cannot be performed by a bishop or general vicar only. This is a shared responsibility, that is why our council is so very important”. Bishop Hlib Lonchyna, Eparch of London who for many years has been a friend and advisor of the Eparchy shared his recipe of love to a neighbor: “How to love a neighbor? Not the one who is easy to be loved but the one who irritates us, the one who harms us? It seems impossible. But love is not just a feeling, it is a willful decision. We decide to wish people well. To wish good to people is actually called love. Quite often it means not to indulge one but wish him sincere conversion. When we think from the perspective of eternity – it softens our hearts”. The delegates of the council voted for resolutions which will be published soon.